As well as practicing veterinary medicine. I am a loving pet owner. I have two intemperate German Pointers, along with two spirited feline inhabitants, the latter of course being in charge. Outside of work, I enjoy spending time with my family and friends, reading, travelling and when ever time permits, playing golf. I joined Haven Veterinary Practice many years ago, following my graduation from Liverpool University. I spent some time in the 90's working overseas in Newfoundland, Canada where I treated moose and bald eagles alongside the more regular patients. My professional interests have always been in general surgery, more recently in surgical oncology and reconstructions. I have a great interest in the advancement of medicine, both canine and feline, and a continued interest in rabbit care. Life at home is busy too. Teenagers!! Escape time with my little dog Lilly is cherished, we often go for long walks away from the crowds. As a retired sportswoman, I still like keeping active and cycle many of the local charity bike events. Most of my holiday time is spent on active pursuits, long distance hiking and hill walking, enjoying wildlife along the way. 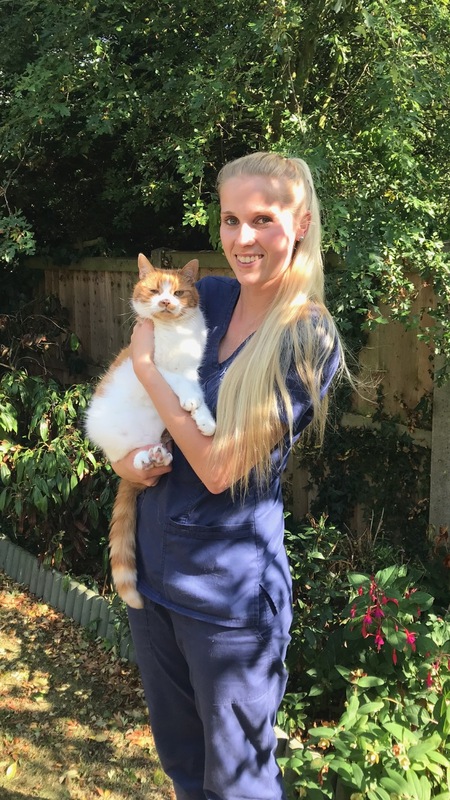 I graduated from Bristol University in 2005 and worked in a mixed but predominantly small animal practice in Suffolk prior to joining Haven Veterinary Practice in 2008. I enjoy all aspects of small animal practice but have a particular interest in small animal medicine. I have two young children who keep me on my toes!! As well as spending time with my family, when not at work, I enjoy baking, reading and being outdoors. I qualified from the University of Liverpool in July 2010 and started working at Haven as a new graduate a month later. It was not long before I acquired my one eyed cat, Betty who was abandoned as a very young kitten. I have had a busy few years enjoying general practice and have a particular interest in small animal medicine. I now have 2 young children who keep me and my husband more than occupied, we enjoy spending time out in the fresh air whenever possible. strong interest in the geopolitical situation of the world. Wales, Surrey and Dorset before returning to Essex to be close to family. After qualifying from Cambridge University in 2003 my first job took me to a small animal practice in the New Forest. I spent 5 happy years working there and along the way re-homed a Labrador and a troublesome cat. However having grown up in East Anglia I decided to return in 2008 to be closer to family and friends. I joined a busy small animal practice in Colchester, Essex; where I developed an interest in ultrasonography. I have recently joined Haven Veterinary Practice at the end of 2016 and I am enjoying being part of their friendly team. but in particular enjoy surgery and emergency work. enjoy playing volleyball and travelling. I have been working at Haven Veterinary Practice since 1995. I initially started life as a receptionist at HVP and then went onto undertake my veterinary nurse training in 1998. I qualified in 2001, and enjoyed all aspects of veterinary nursing, providing the best care I could for my patients. Not long after I qualified I also took on the responsibility of student nurse training within the practice, I was tasked with the training and development of our student nurses, a role I enjoyed immensely. 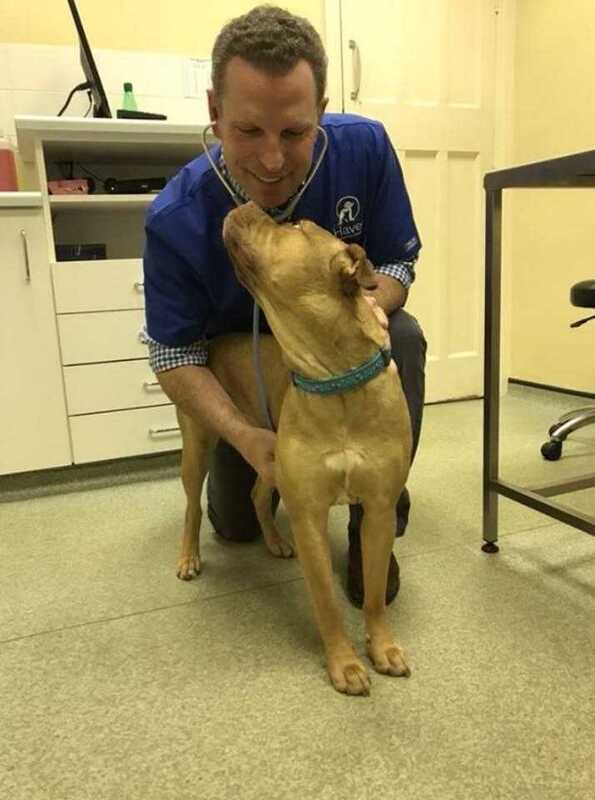 Over time within the practice I have also been involved with the administration side of the business, including processing insurance claim forms, health and safety and dealing with the various animal charities. In 2015 the opportunity arose to become practice manager, a new challenge that my previous roles had equipped me for, and one, which I am really enjoying. Even after so many years, each day is different and there is always something new to learn. At home I have two boys, who most definitely keep me on my toes, several rescue cats and a dog. 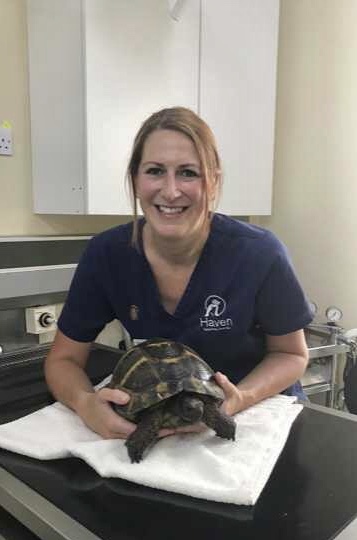 I joined Haven Veterinary Practice in 1996 as a student nurse, my training included time spent at the practice as well as studying at the Royal Veterinary College. I qualified in 1998 and returned to Haven, becoming head nurse in 2000. I love all aspects of my job and have very much enjoyed watching the practice grow over the years. I am proud to be a part of such a caring professional team. I have a soft spot for tortoises, and love nothing more than to share my knowledge and advice on feeding and husbandry with our clients. As is the case with all veterinary nurses, I have my fair share of waifs and strays including a few shelled friends. Outside of work my time is spent with my children who are lots of fun and certainly keep my husband and me on our toes! Maisy and Max, a cat called Trevor, which I took home from the practice. and in my spare time I love looking after my son. 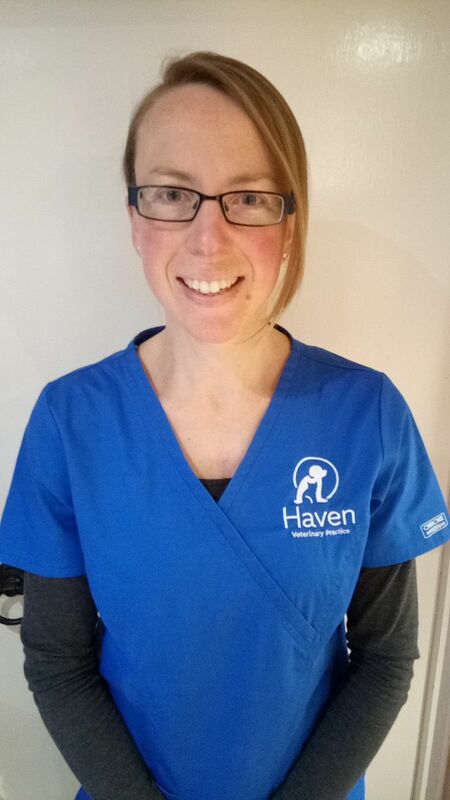 I started working at Haven Veterinary Practice in 2011 and qualified as a Registered Veterinary Nurse in 2015. My main interests are radiography, medical nursing and nutrition. 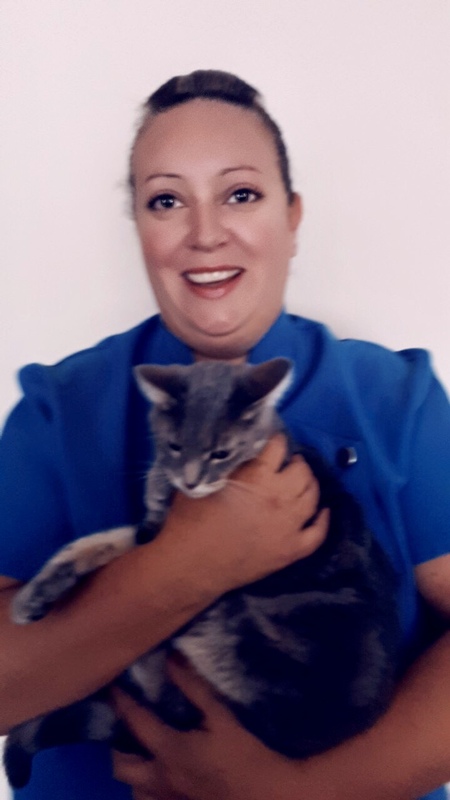 I am responsible for running our 'Portly Pets' weight clinic and have completed a certificate in Canine and Feline Veterinary Health Nutrition. In 2018 I became a clinical coach, which enables me to help train the students. Outside of work I enjoy spending time with my three horses Beau, Dumbledore and Tom and travelling the world. I qualified as a veterinary nurse in August 2016 after training for two years at a previous practice. 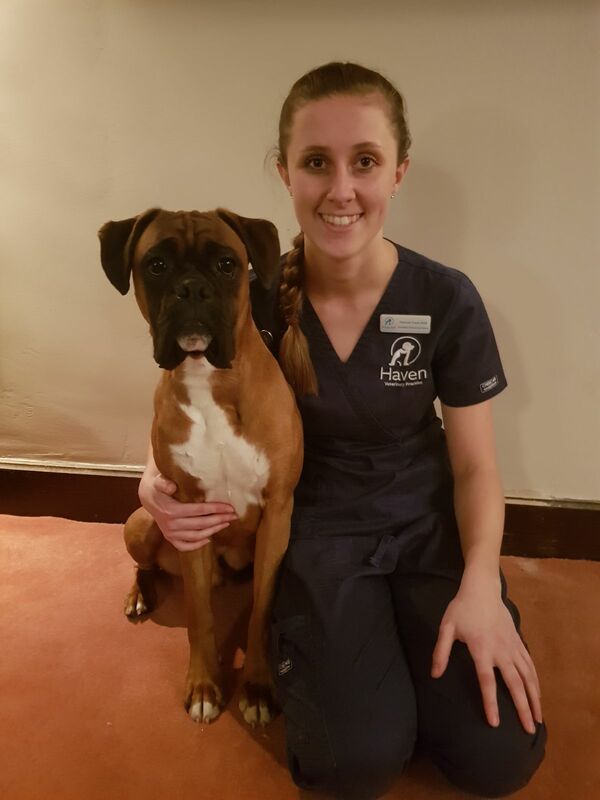 I joined Haven Veterinary Practice in May 2017 to be closer to home after getting my bouncing boxer. I have a keen interest in medical nursing and emergency work which I find increadibly rewarding. Outside of work I love going for long walks with my dog Hugo and looking after my 2 cats Misty and Smudge. I started working at my first practice as a kennel assistant in 2003 and then went on to train as a nurse, qualifying 2008. I joined Haven Veterinary Practice in April 2016 and I am enjoying every minute. I love hand rearing orphaned kittens and have re-homed several over the last few years. Outside of work I enjoy spending time with my friends and family and I live with my black and white rescue cat called Lucy. I joined Haven veterinary Practice in October 2014 and started my trainee nursing the following February. I qualified in February 2018. I really enjoy surgical nursing and theatre work, I also like to provide the best care I can for our medical patients. I enjoy nursing exotics and have a soft spot for birds, especially parrots. In my spare time I enjoy horse riding, attending car shows and caring for my pets at home, I have a parrot called Flo and snake called Tango. I started my Veterinary training at Haven Veterinary Practice in July 2015, and have been attending Writtle College since September 2015. Having been brought up with an array of animals at home I decided Veterinary Nursing was the career path I would like to take. I left school and attended Otley College for two years studying an extended animal management course. I qualified in Spring 2018. 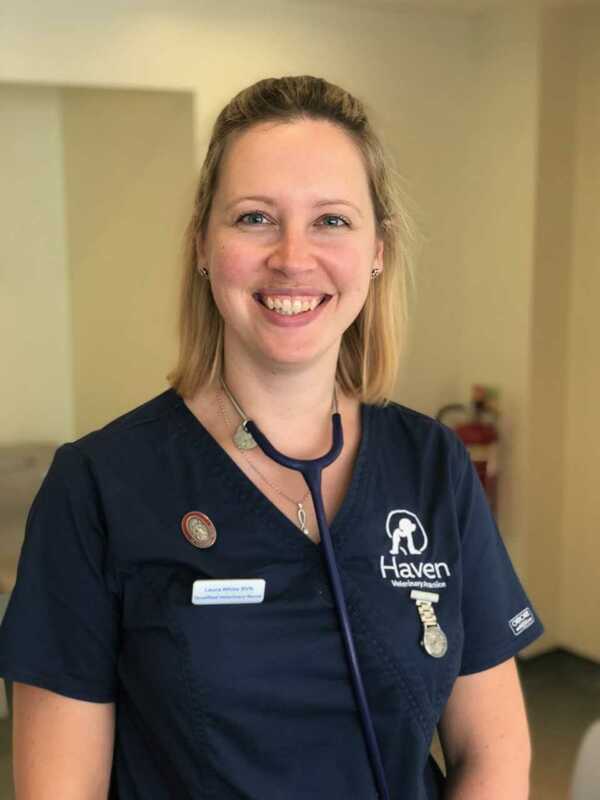 I am the newest member of the nursing team having joined Haven Veterinary Practice in August 2018. I qualified from Writtle College in 2001 and bring many years of experience to the practice. I enjoy all aspects of practice life but have a keen interest in surgical nursing and nurse consultations. I have a very spoilt cat called Toby at home. I have been working as a receptionist at Haven Veterinary Practice since 1999. My hobbies involve my animals, namely dog training and animal behaviour. I have dogs; cats and I also have a rescued retired racehorse. They are all very special to me. 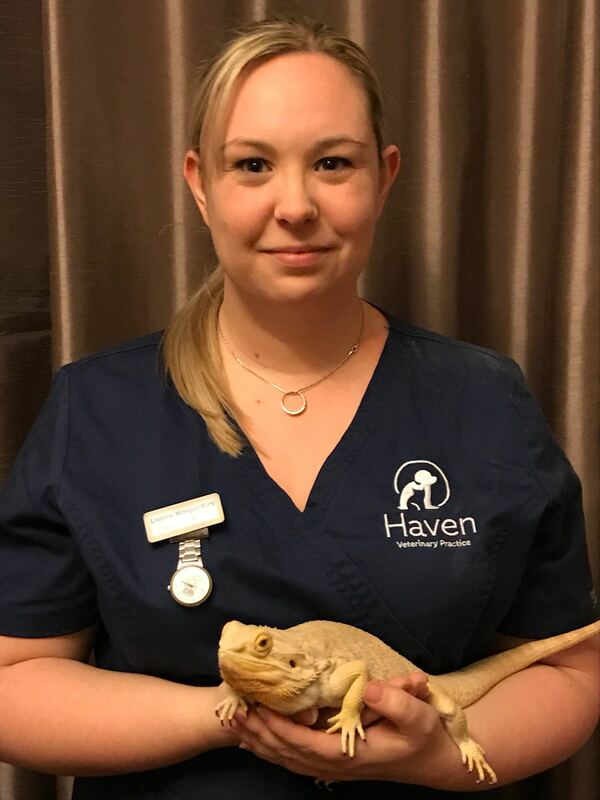 I began working as a receptionist at Haven Veterinary Practice in April 2017, I am pleased to be part of a very caring and friendly practice. I previously worked in another veterinary practice for 20 years. I have 2 dogs that I enjoy to walk and have 2 grandchildren who keep me very busy in my spare time. I have been working as a receptionist at Haven Veterinary Practice since May 2016, after working with children for 14 years. I really enjoy meeting all of our clients and their pets, especially some of our exotic patients. I am currently completing a course in Animal Care, Welfare and Ethics, which I am thoroughly enjoying. Undertaking this course has taught me alot and I feel that it helps me within my role. I have a dog and a guinea pig at home that I love. In my spare time I enjoy dancing and taking my dog Sherlock for long walks. 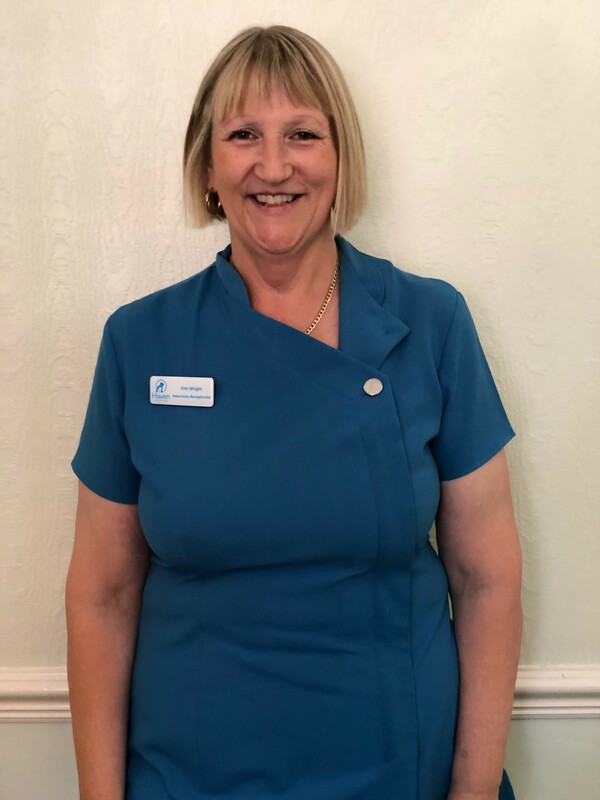 Hi, I am Julia and I work full time running our branch surgery in Elm Tree Avenue. 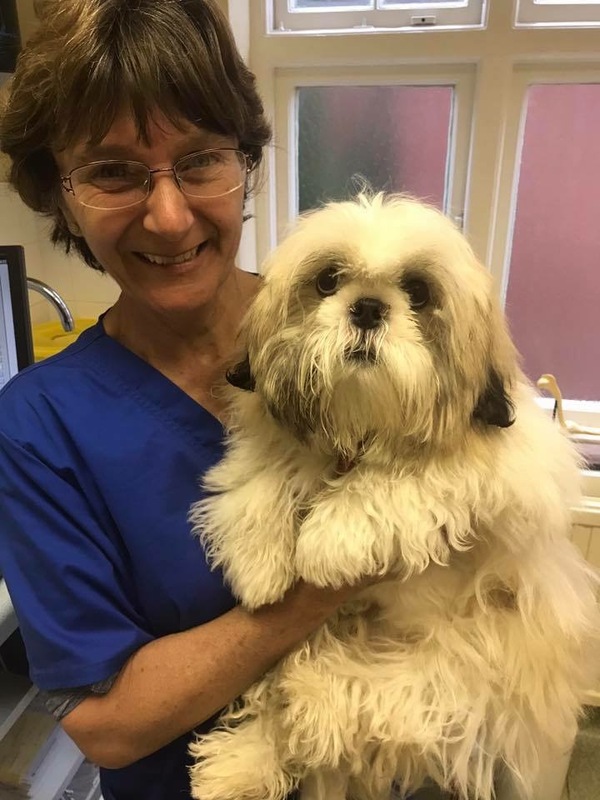 I have worked at Haven Veterinary Practice for over thirty years, having qualified as a Veterinary Nurse in 1970. So if you visit our Walton Surgery mine will be the face you see behind the desk! I have two grown up sons and eight grandchildren, who keep me on my toes. In my spare time (ha ha) I enjoy reading, particularly history, quizzes, baking and socialising with friends. I joined Haven Veterinary Practice in September 2015 as a student nurse. I enjoy caring for in-patients, as this can be very interesting and pleasing. I enjoy my college work and I am very interested in laboratory work. Outside of work I enjoy riding my horse whilst keeping an eye on his cheeky companion. I also enjoy looking after my cat and two beautiful dogs that are always full of life! I started training to be a veterinary nurse in September 2016 at the Central College of Animal Studies. I came to Haven Vets in February 2018 to continue this training. I enjoy spending my free time with my horse Muffin and compete in dressage competitions around the country, I also enjoy walking my two dogs and caring for my guinea pigs. I have a particular interest in looking after the inpatients and ward nursing. I started working at Haven in May 2017. Prior to this I had been working in Newmarket at The Animal Health Trust and Ipwshich at Christchurch Orthopaedic Veterinary Referrals. 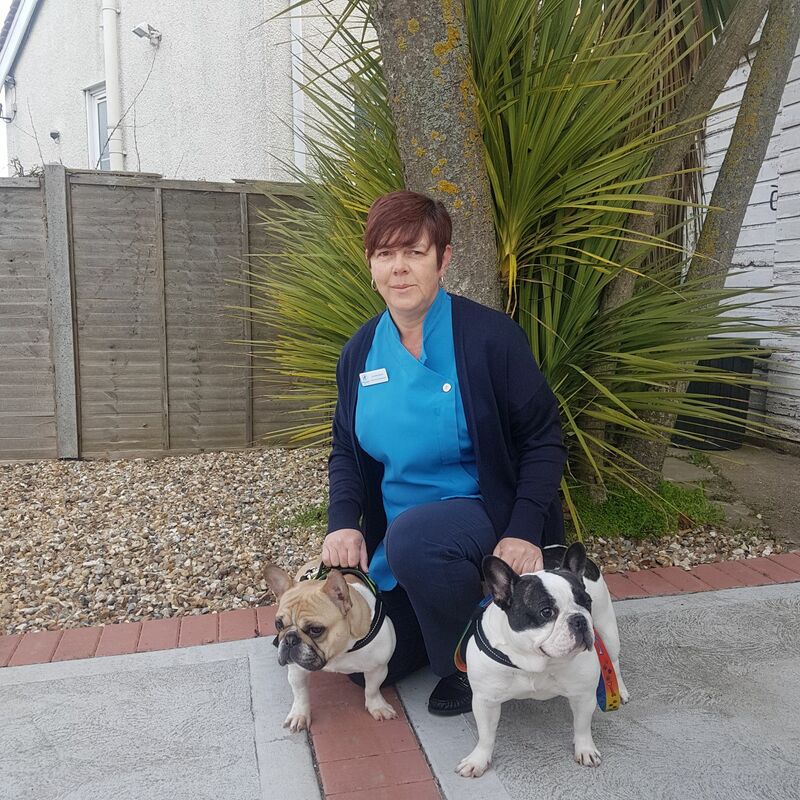 I also have a foundation degree in Animal Science and Welfare and am currently carrying out my nurse training here at Haven Veterinary Practice. I am now in my second year of training and attend Writtle College weekly. At home my pets keep me busy! I have two crazy Labradors (Flint and Lola) which eat me out of house and home and a black and white rescue cat called Pablo. Outside of work I enjoy taking my dogs out for long walks and spending time with my friends. 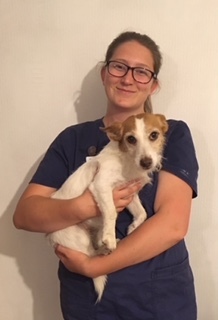 I started working for Haven Veterinary Practice in June 2017 and began my training as a Student Veterinary Nurse in February 2018. I enjoy my college work, particularly anatomy and physiology as it is relevant in day to day practice. In terms of nursing, I love being on ward duties and giving the best care possible to our patients. At home I have a guinea pig called Dumbo and a rescue cat called Arthur. I have been a Veterinary Nurse and Practice Manager with Haven Veterinary Practice since 1978. I now work part-time for the practice, carrying out various forms of administration work, including insurance claim form completion. Outside of work I love to garden with my Daschund Lucy, and have an interest in history; particularly the history of gardening. I joined the practice in March 2009. Previously I worked and qualified with a local firm of accountants in Colchester before taking a break to have my two boys. Our household is football mad and in between training and matches for the two of them and my big kid of a husband we are heavy users of Sky’s football coverage. We have a very cute black and white cat called Tinkerbell, who we adopted after she was abandoned. She is not that bothered about the football! in April 2004. I worked in a veterinary practice in London and enjoyed it so much I decided it was the career for me. I have a hand reared cat which I rescued from Haven who is very naughty and keeps me on my toes but I adore her. In 2010, I passed a Book Keeping course which I did in my spare time and use some of what I learnt at Haven, I'm now responsible for a large amount of the administration work including running the Pet Health Plan and many other behind the scenes work which keeps the practice running. In my spare time I enjoy spending time with my friends and family.